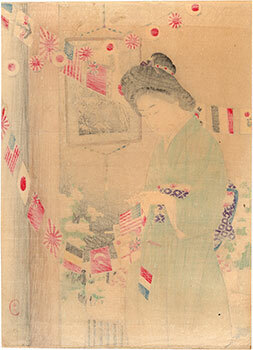 Kuchi-e (口絵) woodblock print made in 1904 by the artist Mizuno Toshikata (水野年方) a few months after the beginning of the Russo-Japanese War (日露戦争) and depicting a young woman intent on preparing for the celebration of one of the many victories achieved during the conflict by the Japanese navy. 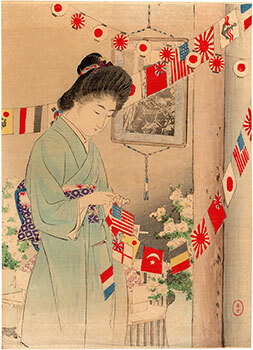 In the background, partially hidden by the flags, a portrait of the Emperor Meiji (明治天皇). Mizuno Toshikata (1866 - 1908), a pupil of Tsukiyoka Yoshitoshi (月岡芳年), was a traditional genre painter much appreciated by his contemporaries. 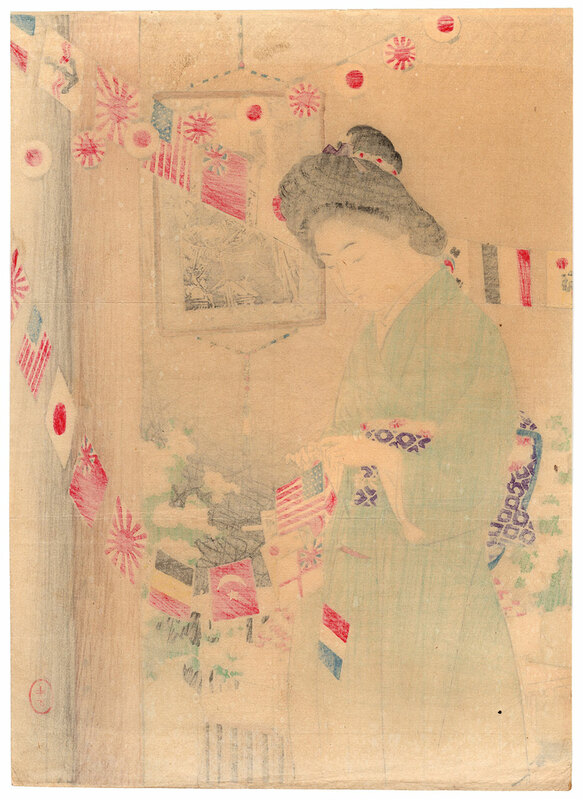 Active especially in the production of front pages for novels, as well as woodcuts depicting historical subjects and beautiful women, he gathered around him and formed young talents such as Kiyokata Kaburagi (鏑木清方). Member of the Nihon Bijutsu Kyokai (日本美術協会), in 1904 he participated to the Universal Exposition in Paris. The print, published by Hakubunkan (博文館) and intended for Vol. 10 No. 14 of the literary magazine Bungei Kurabu (文芸倶楽部), despite the right patina of time and a slight bending sign in the upper left corner, is in good general conditions.